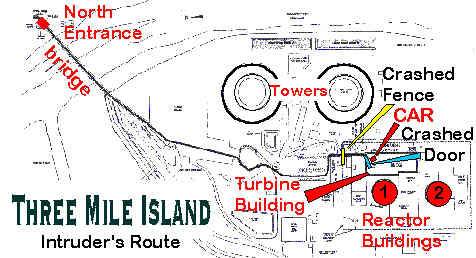 Another emergency at the Three Mile Island (TMI) Nuclear Generating Station on February 7, 1993 demonstrated security weaknesses at US nuclear plants. Operators declared the highest level of emergency since the accident when an intruder was loose in the plant. Reactor Unit 1 was operating at full power. Shutting it down would require workers to manipulate equipment from outside the locked control room and thereby place them in jeopardy of becoming hostages. A hostage situation could raise the threat level to unthinkable scenarios where operators would have to make decisions on their buddies' lives. If the car or the intruder is armed with explosives, a catastrophic radiological release may be hours or even minutes away. Many people living near TMI re-experienced old familiar fears and even traumas that they had been trying to forget. A family about to return from a vacation called their neighbors to see if it was safe to come home. Something as frightening as a nuclear disaster can vex the soul for a long time. The apprehension started when a 31 year old man suffering from depression drove his mother's 1984 Plymouth station wagon into the guarded entrance at Three Mile Island, crashed through the protected area fence and then through a roll-up door. The car stopped 63 feet inside the turbine building. He exited the car, descended a ladder and hid in the darkened belly of the condenser pit. It was so dark that guards put off performing a thorough search until brighter flashlights were made available. In the meantime, the plant continued operating at full power while the control room staff carefully watched the gauges and alarms for any changes that would indicate sabotage. 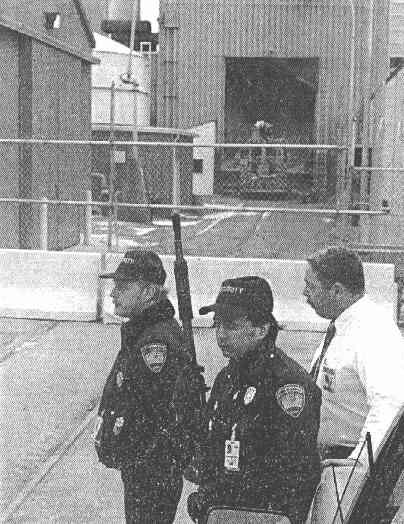 Guards assumed defensive positions to protect some of the more vulnerable equipment and hid in spots where they could see strategic portions of the enormous turbine building. All access doors were locked by computer control; yet, the NRC knew this would only slow down an intruder armed with a satchel charge by fifteen seconds. Locking the control room doors had the unfortunate effect of delaying calls for offsite responders. In fact, the control room shift foreman informed some responders to standby at home because of the inability to move about the plant. Four hours later the intruder was found curled up in a fetal position and seemed unaware of his surroundings. He was arrested, charged with four felonies including "risking a catastrophe" and then hospitalized for psychiatric observation. The intruder was not hostile and the only damage to plant systems resulted from the car's striking equipment in a place and manner which did not directly threaten public safety. "....the strategies used during the intrusion would not have precluded an individual with attributes associated with the Design Basis Threat from reaching and attempting to enter the vital area before being interdicted by armed responders." But this simple act which took less than two minutes, by a mentally ill man who was only looking for notoriety, exposed numerous security problems at a world famous plant that just happened to have the nuclear industry's highest security rating. The team reported that the response weapons were stored in isolated locations and that there was a reluctance to use certain weapons. Not all of the vital doors were guarded and some guards left their posts. Poor lighting in the turbine building hampered a thorough search. Some of the responses and security preparedness were reviewed by the NRC for non-compliance. Not all of the armed guards were where the NRC had instructed them to be. Communication devices were used too close to the vehicle and could have detonated a bomb. Previous drills had revealed weaknesses which reoccurred when it came time for the real thing. Unbelievably, the IIT concluded that GPUN had responded appropriately. How could they make this claim? They simply add the phrase, "to the specific challenges presented by the intruder." At the April 6, 1993 briefing of the NRC commissioners by the IIT, Commission Chairman Ivan Selin volunteered that security had not faced a difficult test. Selin said, "The fact was this guy, wasn't hostile, he wasn't armed and he didn't do anything. So, almost anything that they would have done would have been appropriate in that sense, and there would not have been radiological damage, et cetera." But, Selin wanted to know if thoughtful decisions had been made or if GPUN just did things that "turned out okay." Team leader Sam Collins replied, "My opinion of that would be, we didn't directly address that in the report." "Out of the confusion and concern for personal safety, operations staff made decisions that could have negatively affected the public health and safety. Even when an initial assessment was made, licensee staff did not know how many unauthorized individuals were inside the protected area, where they were, and whether they possessed weapons or explosives."